A biocontainment laboratory is a laboratory that has been designed to lessen or completely prevent the escape of microorganisms. There are four levels of biocontainment laboratories. Each level must meet certain design criteria, and each is designed for research involving certain microbes. The four levels are designated as Biosafety Level (BSL) 1, 2, 3, and 4. The typical university research laboratory is a BSL-1 facility. Such a laboratory has few restrictions on who may enter, connects directly with the remainder of the building, and, other than the wearing of lab coats and observing normal lab hygienic practices, has few specialized safety features. For example, work is done on open-air bench tops without specialized equipment designed to contain the organisms (e.g., fume hood). The safety features that are in place in a BSL-1 facility are routine. Examples include hand washing before and after work in the lab, decontamination of bench tops before and after use, restrictions on food and drink, and sterilization of all materials that have been in contact with microorganisms. The work space is constructed with sealed seams and a crevasse-free surface, to lessen the chances that microorganisms will pool in a hard-to-reach location and grow. Personnel in a BSL-1 laboratory are trained in the techniques necessary to prevent contamination of the experiment or themselves. These techniques are not complex and undergraduate students can safely study in a microbiology teaching BSL-1 lab. A research technician conducts experiments that include challenging insects with a virus mixed with blood at the U.S. Department of Agriculture Arthropod-Borne Animal Diseases Research Laboratory, a biocontainment laboratory that specializes in animal diseases that are transmitted by insects, including plague, West Nile, and tularemia. safety features are in place to allow microorganisms that are potentially hazardous to health to be studied. For example, lab personnel are trained in the handling of specific disease-causing microorganisms, more care is taken when handling the microbes (i.e., wearing sterile gloves). Access to the BSL-2 lab is restricted and the doors remain closed when experiments are in progress. Because of the presence of microorganisms that can pose an increased health threat, people who are known to have a less efficiently operating immune system are not allowed inside the laboratory. Even those with normal immune systems are tested regularly for evidence of infection, or can be vaccinated against the microbes they work with. Procedures like blending and centrifugation create the opportunity for organisms to become airborne. Special protective clothing such as a facemask is worn, and biological safety cabinets are present. The location of the specialized equipment must be approved (i.e., a safety cabinet is not allowed to be by an open window or the door to a hallway). There are no specific ventilation requirements for a BSL-2 laboratory. Air enters and exits the lab via the building's ventilation system. If windows are present, they can be opened. BSL-3 Laboratory. This facility is designed for work with microorganisms that can easily become airborne and that carry a great risk of infection. Often a BSL-3 laboratory is in a hospital or an infectious disease research facility. 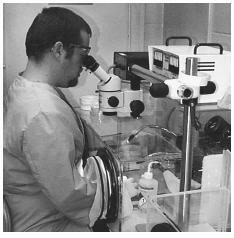 One distinguishing characteristic of a BSL-3 laboratory, compared to BSL-1 and BSL-2 labs, is the requirement that work with the microorganisms be done within biological safety cabinets or other containment equipment, or by personnel wearing protective clothing (i.e., wrap-around gowns, scrub suits, coveralls, gloves that are changed frequently). Another characteristic is increased restrictions for access to the lab. For example, newer facilities must have double doors, which are sealed around their edges. The first door that connects to the outside of the lab must be fully closed before the door to the BSL-3 lab is opened. Ventilation systems in the BSL-3 lab are independent from the rest of the building's ventilation system. The air from the laboratory is exhausted directly to the outside and not into the general building circulation. The exhaust air is also filtered to remove microorganisms. Also, ideally the airflow through the laboratory should be balanced (i.e., the air flow into the room is the same as the air flow out of the room) and should flow from areas that are not used for experimental work such as office space to areas containing the microorganisms. The floors and walls of a BSL-3 laboratory are designed to be free of cracks, impermeable to fluids, and chemical resistant. While windows are permitted, they cannot be opened. The satisfactory performance of all equipment and personnel in the lab is regularly monitored and recorded for inspection. The lab and the personnel are re-verified each year. BSL-4 Laboratory. The BSL-4 facility is designed for work with microorganisms that pose a dire health threat. The most infectious microorganisms (i.e., Ebola virus, Bacillus anthracis (the cause of anthrax), the Marburg virus, and Hantavirus) can be handled only in a BSL-4 laboratory. A newly discovered microorganism that is genetically related to a known extreme pathogen will also be handled in a BSL-4 lab until, when, and if it is demonstrated that the organism does not pose a threat to health or life. Two hallmarks of the microorganisms that can be handled only in a BSL-4 laboratory is their ability to be easily transmitted from and to people via the air, and from person to person (they are highly infectious). The design of a BSL-4 laboratory prevents the release of these microorganisms into the environment and protects the researchers from infection. An example of a BSL-4 laboratory is the one that is present in the United States Army Research Institute of Infectious Diseases, in Fort Detrick, Maryland. At 10,000 square feet, the USAMRIID BSL-4 facility is the largest highest-level biocontainment laboratory in the United States. As of 2002, three other BSL-4 labs exist in North America. The others are at the Centers for Disease Control and Prevention in Atlanta, Georgia, San Antonio, Texas, and Winnipeg, Manitoba, Canada. A fourth BSL-4 laboratory is planned for the National Institute of Allergy and Infectious Disease's Rocky Mountain Lab in Hamilton, Montana. The personnel who work in a BSL-4 laboratory have been highly trained and certified. They are experts in microbiological techniques and in the containment of infections. Only these lab personnel are allowed into the laboratory. Entry to the Level 4 area requires passage through several checkpoints and the keying in of a security code that is issued only after the person has been successfully vaccinated against the microorganism under study. All work in the level 4 lab is done in a pressurized and ventilated suit. Air for breathing is passed into the suit through a hose and is filtered so as to be free of microorganisms. Standard operating procedures are in place for every technique and operation in a BSL-4 laboratory (i.e., changing a filter on a reverse osmosis filtration device), and all work done in the laboratory is documented. A BSL-4 laboratory is completely isolated from the rest of the rooms in the building. Ideally, the lab is located in a separate building. The laboratory is designed to be a secure facility with respect to the escape of microorganisms. Until now, security against sabotage or deliberate damage has not been a design feature. However, this is changing. The BSL-4 laboratory proposed for Hamilton, Montana, will be in a fenced and guarded space, and will be equipped with observation cameras, multi-levels of secured access, and complete illumination of the exterior of the lab at night. Richmond, Jonathan Y., and Robert W. McKinney (eds.) Biosafety in Microbiological and Biomedical Laboratories, 4th edition. Washington, D.C.: U.S. Government Printing Office, 1999. National Institute of Allergy and Infectious Diseases. "An Integrated Research Facility at Rocky Mountain Laboratories: Questions and Answers." Office of Communications and Public Liason. November 5, 2002. < http://www.niaiad.nih.gov/dir/infobs14/bs14faq.htm >(06 December 2002). USAMRIID. "Welcome to USAMRIID." The U.S. Army Medical Research Institute of Infectious Diseases. Fort Detrick, MD. July 25, 2002. < http://www.usamriid.army.mil/ >(25 November 2002).